The distinctive NEON experience starts with the stylishly contemporary building design, an articulated expression of glass, steel, masonry and precast elements, with fresh air balconies and expansive terraces that add character and nuance. Rising 20 storeys above Toronto’s most happening neighbourhood, NEON resonates with the panache of its incomparable location, and culminates in a spectacular rooftop terrace lounge with outstanding views all around. Revel in the sleek modernity of its subtle blue tinted façade, its enigmatic drama of light and shade, its strong and welcoming presence a metaphor to everything Yonge and brilliant. Unlike MYC and Allure, both being built on Yonge Street, Neon is just off of the busy stretch, tucked away behind the Yonge and Eglinton Centre on Duplex. The project initially faced strong neighbourhood resistance, with area residents being opposed to the height and increased density, however the issue seems to have been resolved and construction has now begun. NEON offers a full complement of club-style amenities to inspire body, mind and spirit. Host a spectacular celebration in the Lounge with the glittering skyline all around. Stay fit and feel good about it. Watch a blockbuster in the comfort of your own private theatre. The Yonge and Eglinton Neighbourhood is one of the most sought-after neighbourhoods, located in Midtown Toronto. It’s where style meets fashion, cuisine, and culture. Where the rush of downtown meets the calm of midtown. Where avid shoppers can find an eclectic mix of boutiques, specialty retailers, as well as the necessities of life. 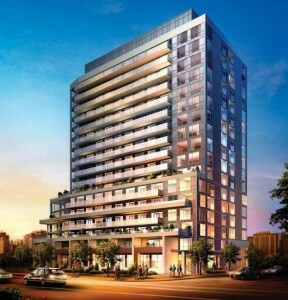 When complete, the condominium will reach 20 storeys and contain a total of 218 units. The site is located just across the street from two rental buildings (411 Duplex, 22 storeys, and 33 Orchard View, 17 storeys) that contain 782 units in total. Hariri Pontarini’s starkly contemporary building will contrast with the oft-derided Brutalist towers, relics of Yonge and Eglinton’s earlier development boom in the 1970s.